It's taken a long time, but I finally updated my t-shirt gallery. 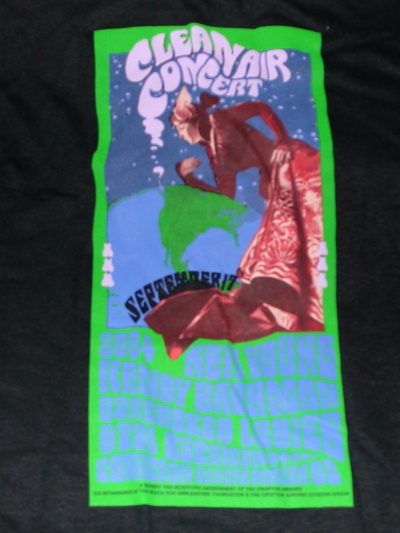 When I heard of this concert it was a huge shock, Neil Young in my old home town. Even though I didn't really have the money I had to go. Luckily I was between work and starting school so I could sleep outside to get tickets. That's pretty much what it took to get them. I could have gotten in line a little sooner. I could have tried to do a little profiteering. As it was I bought the maximum number of tickets (six) as my Aunt & Uncle decided they wanted one, and I got a pair for Jason and his friend. The same Jason I had bumped into at the last Neil Young concert I attended. My mom got the last ticket. Sleeping, or not sleeping cause I'm such a light sleeper, in the streets across from my old high school was interesting. There was good commeraderie in the line with not too much butting in or holding places. Though undoubtably some went on, most people seemed to be buying tickets for themselves and/or friends and family. This resulted in a good vibe in the line and a small town family atmosphere at the show, rather than a lot of pretentious out of town hipsters descending on Duncan. The concert itself was held in the Cowichan Community Center hockey rink. Neil cracked a joke about being able to get a beer because it was a hockey rink. There were a few speeches and videos which were a bit controversial as some at the concert were the activist type others were mill workers or concerned about the loss of jobs in the valley. The first performer was Tal Bachman. Then his dad played with his band of locals. Supposedly he asked the Sadies to play on his next album. Neil played an unplugged set. He played piano (several songs including "Journey through the past") and banjo ("Old King") in addition to acoustic guitar and harmonica. His wife accompanied him once or twice, he had some guitar troubles, but Larry Cragg was on hand as always. His set was short and I have seen him give better performances. I was hoping for "Prairie Town" but it never happened. He must have left right after his set because he wasn't in the big finale. The Bare Naked Ladies headlined. They played a few bars of "The Needle and the Damage Done", well Ed did. They also covered the Road Runner Theme song. They used one omni-directional mic and no drum kit. It was a good performance and made up for Neil's appearance being a little brief. They did a karaoke cover of "You ain't seen nothing yet" for which Randy Bachman joined them on stage. My mother enjoyed their set the most too. It was an interesting experience though staying up all night on the streets of Duncan was a bit odd. Luckily the weather was good. Spending all that time outside in the wind and the rain would have been trying.